Woot! Game of the Year….great job MM! This is great news but what exactly is going to happen with the ‘First Week’ stuff (shirt and astronaut suit)? Is today the official first day? I’ve been all over the single player mode this weekend. Can’t wait to co-op with friends! When will be seeing online co-op map create? I put the game, get the patch (I own a early copy) and now my other pad (a generic one) don’t work anymore, but I have no problem , and the pad work as fine as my sixasis before the patch. Make sure to check out my beta level: SuperUltraHappyFunPlace! It’s a challenging set of rooms designed to provoke your mind and has a time challenge to prove the toughest of competitors! Enjoy! Yay so happy. I’m gonna go pick up my preorder copy. Hope to see some of you online. Great. Now if the game would only come to Indiana. Mark: Where is the “exclusive to first week purchasers” Astronaut costume? Save early– Save often when creating! also – careful not to attach too many connecting things to the bottom of any level and then try to build on top of it..
after too many items are connected, a limit is reached, and then the game starts to delete the FIRST stuff you placed that was connected so you can add more..
be careful so that your creation doesn’t just fall over! i suggest making your levels and then applying stickers..
don’t forget to “copy” your creations to your portfolio- you can them use them over and over again!!! don’t forget that by pressing < ithink< right one and right two trigger buttons to increase or decrease the thickness of your materials..it really helps once you realize3 that! whew! i played the BETA nonstop until they deleted my level.. so i remember it like yesterday! How do we get the “there for launch” space suit and the week #1 t-shirt? why is every message i type “awaiting moderation”???? so i made a list from problems people were having with at the forums, and then posted em, and that got deleted..
and now every message is awaiting moderation??!? what’s next, tapping my phones? it’s official, Jeff is stalking me.. Possibly too long? Limit is like 1000 characters or so. Be brief – this one made it through. Little Big Planet is such an awesome game. Can’t wait for the DLable characters. geez i wish my level “midnight in the gnome garden” was saved from the Beta version to the retail…i wish you could all play it! Great! I just finished the single player game last night. Can’t wait to play on some user-created levels. Awesome! 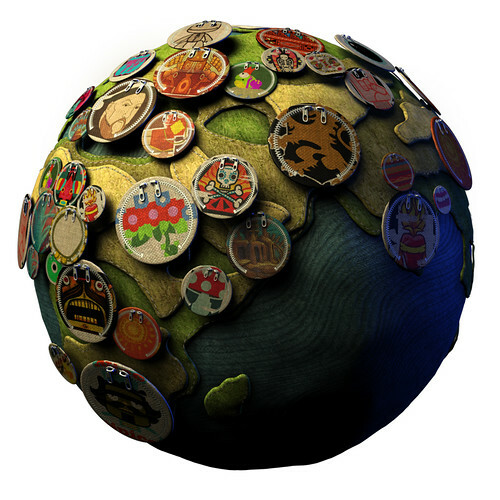 I’m just waiting on some birthday money in the mail to pick up LBP. 1. If you share codes, do you have to log in as the other person like sharing everything else? Or can you just give them the code to use on their own profile after you have already used it? 2. Does the Nariko download only come with her skin? I know the Kratos one comes with other things. Awesome! And just in time as I got a 100% and ACE on every level just an hour or so ago! but that page doesn’t exist. anyone know how to redeem my code? Nooooo!! My beta level is up but it won’t load or copy or do anything!!!! I messed up my Kratos costume pre-order card from ebGames and now I am unable to get my code. Is there anyway I can get another one or am I out of luck? For some reason after patching Winches no longer make any sounds. What’s the deal? My copy should ship today from Amazon. so no more diatribes, huh? i guess it’s a new “anti-rant” feature? so is that comment i made never going to see the light of day? I tried to put in some good tips for LBP players.. Yes!!!! finally i can play online. Great job guys, even though the release was very hectic!!! Mark, will the astronaut “launch” Sackboy and Media Molecue t-shirted Sackboys be free to download from the PS Store this Thursday? yes great question. ditto @30 question. WOOT!!! great news… im already playing it online and found my levels from the beta! one more thing i heard some time ago that we wont be able to create levels with people online… but they said they will have that in a patch once launched… did that patch do that or was that just for the song? Aaaaaand… Any updates on when the UK and the rest of Europe will be getting their pre-orders? I’m really excited about this game – I have been since I saw the 2007 E3 video – so I can’t wait to get it in my machine! I have a question for you guys. I pre-ordered LBP at Best Buy. So I have the code for Nariko, but I would really like to have Kratos as well. Are you guys planning on releasing these characters as DLC on the Playstation Store? I wouldn’t mind paying a buck or so for some of my favorite characters. Exciting! I published my level right before I went to class. Though I think I may have to retweak my old beta levels, they were kinda embarassing. I want to go home sick so I can play. finshing up dead space on the last level will wait till kratos bonus is up to get back on LBP! so if we comment over 1000 characters, it is blocked and can’t be unblocked? even if the post has nothing offensive in it? can’t you just allow it to be seen with you amazing Mod powers? seems kinda limiting, i mean, as long as it is on topic and constructive, what’s wrong with that? HEY!!!!!!!!!!!! Can,t wait to get home from work now. Great job guys. And it is officially time to get sick and go home to play! No doubt: LBP FTW GOY!! What about the codes for the costumes? can we redeem them now? HAs anyone gotten their Amazon pre-orders in yet? The nearest Game Stop for me is almost 50 miles away, and with gas as it is, driving nearly 100-miles round-trip for the game is a no-go… so I’m just going to have UPS bring it to me.